The value added inputs of electronics in an average vehicle have doubled from 20 to 40% since 2004. Today’s luxury vehicles commonly contain 100 microprocessors and run 100 million lines of software code, controlling everything from engine timing to infotainment systems. 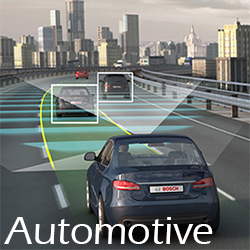 We are now at an inflection point where software, sensors, and processors are delivering entirely new areas of vehicle functionality including the Advanced Driver Assistance Systems (ADAS) systems of today and the autonomous driving systems of tomorrow. This shift will have two effects. First, software will become a critical market differentiator, pressuring OEMs to shorten product cycles and provide support and updates for legacy systems to meet consumer demands for the most advanced technology. This leaves OEMs with many challenges including rapid innovation, complex QA testing, higher development costs, less time to amortize R&D, and the need for new sales and vehicle ownership models. Second, the shift to software is scale intensive and will deliver new transportation models including automation and car sharing. This will require that vehicle OEMs, their suppliers and the entire vehicle ecosystem begin to develop new business models across their value chains.